What Words Do You Use In Serving Your Customers? It’s been years since you studied the parts of speech. Verbs express actions. That’s why great business leaders love verbs. 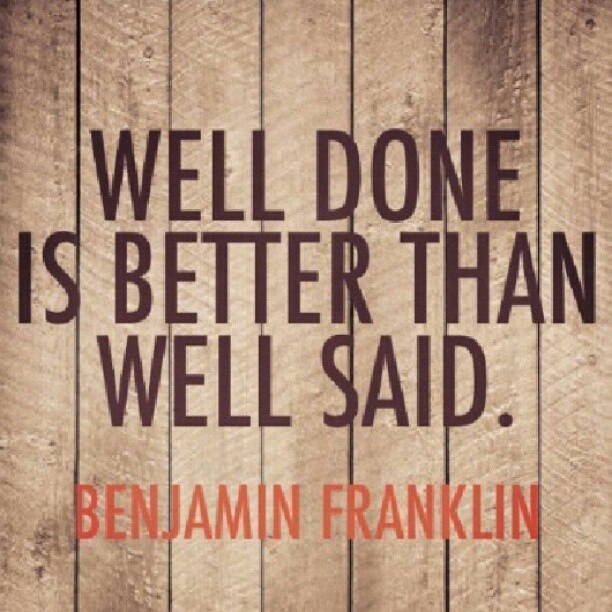 Like the Ben Franklin quote, they put the emphasis and value on action. By the way, I agree with Ben’s quote, but only partly. I think how we say things matters. It matters for two fundamental reasons: a) it conveys the proper mission to our team members and b) it conveys our intentions toward our customers. Most of us lean toward using the terms and phrases we regularly hear. It’s why business speak is so common place. Sit in a conversation with a group of business executives and you’ll be hard pressed to distinguish between them because they’ll all tend to sound the same. No wonder…they all have a similar vocabulary. Somebody, somewhere came up with that and very few companies devote themselves to coming up with something better. Truth is, just about anything would be better because it would at least make you unique if you didn’t follow the herd. No creativity. No effort. Just blindly uttering the same thing time after time, day after day. Never thinking about how negatively it’s impacting their business. A classic case of this insanity is told by Jeffrey Gitomer, famed sales trainer. For more than 20 years I’ve been a Gitomer fan and customer. I’ve given away more copies of his book, “Customer Satisfaction Is Worthless, Customer Loyalty Is Priceless” than any other book. Hands down! In his usual snarky way (which is likely why I’m a fan), he’s telling the audience this story to prove the point. “No, I’m here for my hair transplant.” He goes on to say, “Wouldn’t we all just drop dead if we were greeted with something far better like, ‘You look like you could use a room and I’ve got just the thing? '” Indeed we would. And he correctly argues that the same time and effort it took to use the boring greeting could have easily given way to a far better one if only people (and companies) would pre-think with some creativity. I’m a fan of words because I’m a communicator. Words convey our thoughts, feelings and ideas. We should give them more attention. That’ll give you an idea. Just look at my happiness guarantee on the Hire Me page and you’ll get an even better glimpse. I never want a client to be satisfied. That’s not good enough. I want them to be happy! Elated, even. Sit down today and examine how you answer the phones, how you greet prospects, how you talk with customers and all the other moments of truth that exist in your organization. Rework them. Get creative. Be unique. Stand apart from the crowd by using words that properly (you can’t say one thing and do something different) convey how you strive to serve people.